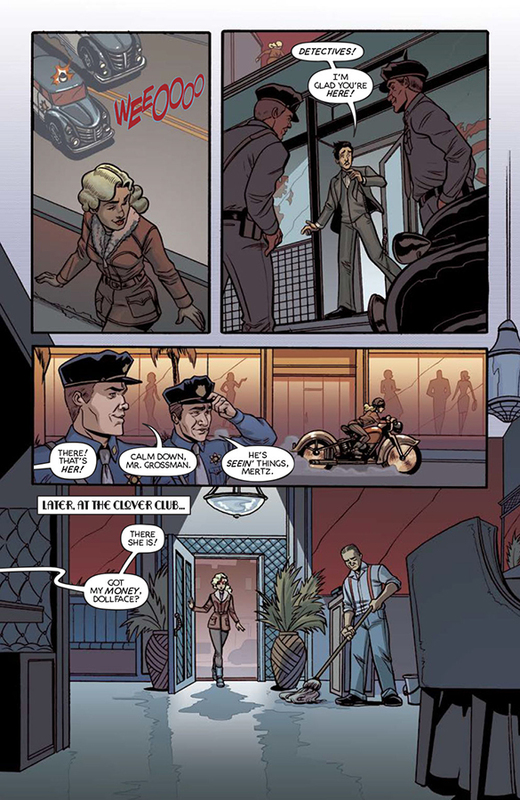 In the opening story arc of their new series, the creators of Angel City peel back the glamorous facade of 1930s Hollywood to expose the dark underworld beneath. It’s a story about two friends who went to the city of angels with stars in their eyes only to end up on two very different paths. Frances follows her dreams into the bright lights while the jaded Dolores settles for working behind the scenes as a stunt woman and mob enforcer. That is until Frances’s body turns up in a dumpster and Dolores reluctantly plunges back into the world she had sworn off in order to uncover the truth behind the murder of her old friend. 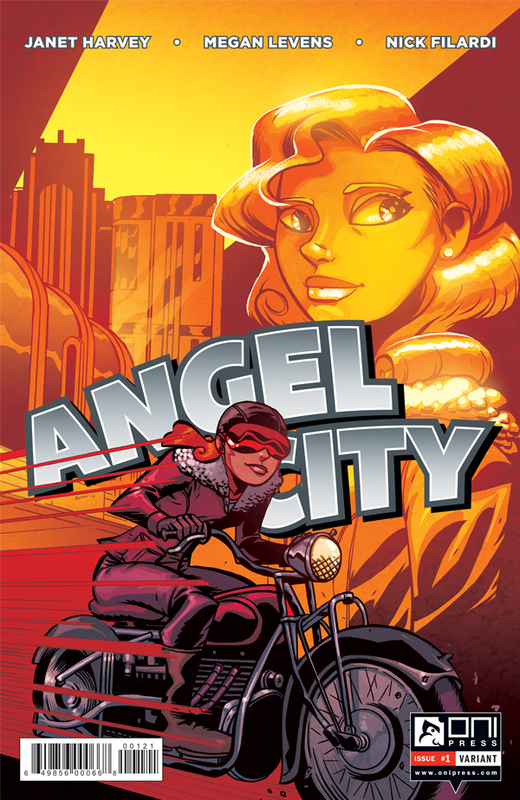 The first issue of Angel City is due out Oct 5 from Oni Press, (if you hurry you can still pre-order it with Diamond code: AUG161792). I had a chance to talk with three members of the creative team, who all share creator ownership; writer Janet Harvey, artist Megan Levens, and colorist Nick Filardi. The conversation occurred live over Google hangouts so we had the opportunity to go back and forth on quite a few topics, including settling some issues between the creators themselves. BROKEN FRONTIER: Angel City takes place during the Golden Age of Hollywood, a setting we often see in film but isn’t very common in comics. Janet, do you have a background in film that you called upon for this project? Janet: I’m actually working on a movie right now called Scene Queen. And I’m sitting in the set for one of the teenage girl’s bedrooms right now. We used my office to for it. I do a lot of film and I lived in L.A. for almost 10 years so I got really fascinated with the history of the city and all the legends and ghost stories that surround it. What led you to the decision to make it into a comic instead of a film? Janet: Well, I also used to work for DC Comics and I was really into the Golden Age comics like the Black Canary comics before she had superpowers, when she rode a motorcycle and did Kung Fu. She started off as a villain and became a hero, mainly because the readers liked her so much that she took over another comic that had been the “Star-Spangled Kid” or something like that, no one even remembers. [It was the Johnny Thunder back up stories in Flash Comics]. And she’s still around. 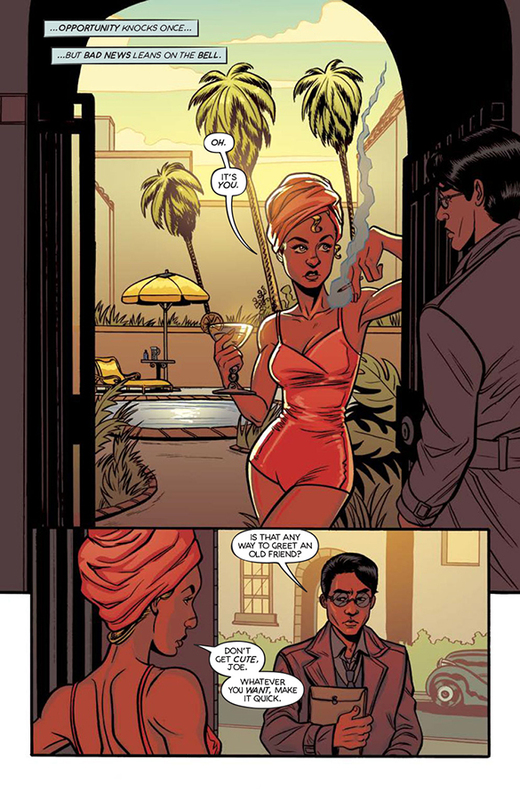 So I thought it would be cool to have that kind of Golden Age heroine but in Hollywood with a noir tone to it. Maybe she’s a stunt woman but fights crime in her off-hours. It came out of that concept. How did Megan become involved? Did you know her at all beforehand? Janet: I didn’t know Megan, but I knew her work on Madame Frankenstein and loved it. 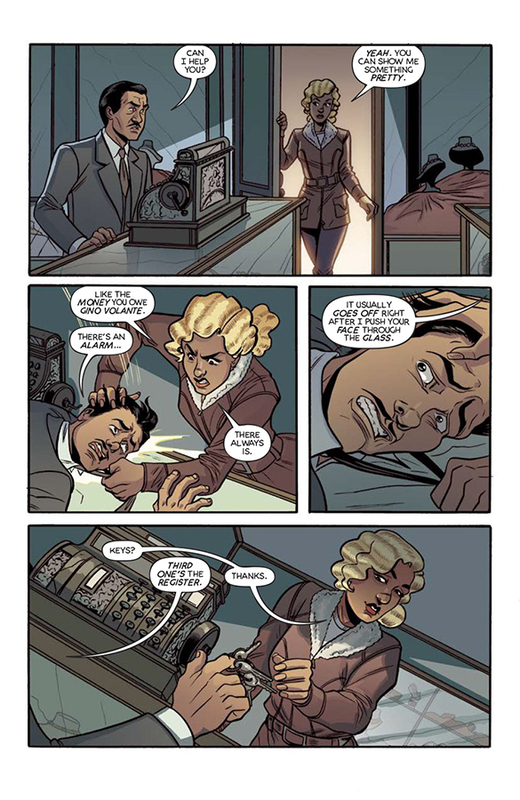 Ari (Oni Press managing editor Ari Yarwood) had suggested her because she knew the fashion and elements of the era. I don’t know if Megan even knows this but we were looking through all her work and one of the things that really struck me was all the cityscapes she did for her advertising work. She really brought this great sense of the character to it, which is important for this story. Megan what did you think when when they approached you about this project? Were you excited because you had so much experience in this time period or were you hoping for something different? I was really excited that someone approached me to do a noir book because before Madame Frankenstein I always imaged I was going to end up doing romance comics or really “girly” subject matter. And then my first book to come out was a horror book. I’m always excited when someone offers me something different so the idea of doing something that had gangsters and guns and shows the seedy side of old Hollywood, that was really exciting for me. Nick: Except for the covers. The covers were colored by a great colorist. Megan: They were beautifully colored. Nick, were those your colors on the covers of Madame Frankenstein? 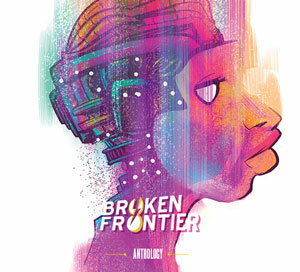 Was Megan the cover artist or was it Joëlle Jones? Megan: Joëlle did the covers. Ok, so you both worked on Madame Frankenstein, but separately. And Angel City is the first time you’re actually working together directly. Did you know each other at all beforehand? Nick: Yes. We went to school together at Savannah College of Art and Design. 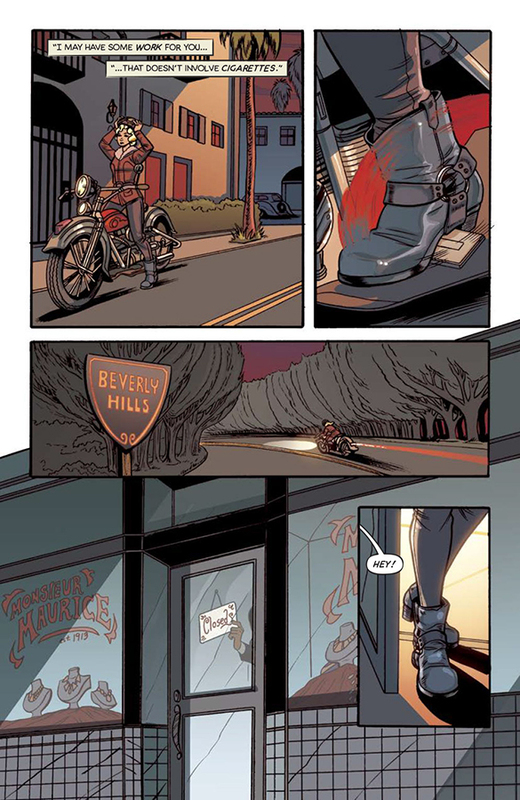 Megan: When we were batting around ideas for a colorist, I immediately thought of Nick and threw his name out there. Nick: We had talked about working together before, not necessarily with this project but in general. I’d see Megan at a con and be like, “Hey, we should do a thing.” Rarely, when I say that does something happen so quickly. Usually it’s like six years down the road, if anything happens at all. How closely did the three of you work together in developing the style and feel of the series? Janet: We did a lot of character designs and I threw a lot of reference at people. That was kind of our development process. I just gave everybody a lot of material and said, “What do you think?” We spent some time going back and forth on the color. We were thinking about doing this thing with those golden age dots… I’m blanking on what that’s called. Nick: I was toying with a lot of different ideas because I want to make each project feel different. I work on Powers which is noir and I didn’t want to just splash what I do with Powers over this and call it a day. So I was thinking about stuff that would echo the time period. I was thinking about doing zip tone to keep it “vintagy” but that didn’t really work for a couple of reasons. Then I was thinking maybe we’d do it kind of like Art Deco, but that also came with its own problems. So then I was like, alright let’s just make it L.A. Let’s make it hot, oppressively hot. Janet: I think the tone he referenced was “sun bleached”. Megan: Yeah, every time I look at a batch of colors I feel like I’m in the living room of my apartment in Van Nuys in the middle of July and it’s 112 degrees and I want to move to Seattle. Nick: The idea was to take all the cold tones and make them cooled down almost to a gray and then amp up the warmth. And also to keep all the windows casting light into the room, that way you really feel the sun is its own character in the world. Janet: As the series goes on we reference a lot more hard shadows and light coming in through the windows with those slats. Nick: Yeah, I’m trying to crow bar that in every single place I can. That’s interesting because this book does have a certain noir feel, but it’s also very different in some ways. Nick: Right, like with Powers, in my mind it’s set in New York City. I don’t know if we ever actually confirm that or not, but in my mind it’s New York. And New York kind of feels more claustrophobic and gray to me. L.A. just feels like you’re beaten down by the sun rather than beaten down by the buildings and the people around you. Janet: Well in L.A, you’re beaten down by the traffic. Megan: You’re beaten down by the traffic while you’re cooking in the sun. Have you guys ever thought about going into the tourism business? You’re really selling me on these cities. Nick: So I wanted to do noir in a way that hadn’t become standardized for noir. I think that a lot of books that go noir go the direction of Powers. And I don’t know if that’s because Powers has been around forever, or if that’s just the legacy of noir and that’s what people think of first, but we wanted to take it and turn it on its head. Do something a little different. Let’s turn our attention to the characters of the story. What did you do make them feel like characters of that time and place? Janet: You know it’s funny because I didn’t want to lean to heavily on the snappy slang of the time and have everybody like “Listen, you…” because I think that sounds very old-fashioned. I wanted it to feel contemporary, although I do like calling everyone sister all the time. They’re like, “Listen, sister…”. So I tried to give it the feel of these very cynical people who’ve been kicked around a bit, but not seem too stereotypical or dated. And then they just started talking to me. I feel like I know Dolores and Aggie and I know what they would say and the more I see Megan draw them, the more I feel like they’ve become real characters. Joe especially was a character we all came up with together and I had pictured him as being a little bit different but I feel like he’s become his own person now and I know what he’s going to do. I know how he’s going to react to things. Nick: Is there any character that gave you trouble? Janet: Rita gives me a lot of trouble. She never does what I think she’s going to do. Megan: That’s why I love her. Janet: And I want her to have more to do. She’s a supporting character so she does a lot of supporting things. But I want her to have her own story down the road because I feel like I don’t know her as well and whenever I think I know what she’s going to do, she does something different. So she’s very interesting to me. Megan: I’d do a Rita spin-off. Janet: Well it is called Angel City, so we could do a spin-off of all the characters eventually. Megan, were there any particular characters you got attached to or particularly enjoyed designing? Megan: Dolores. I definitely wanted her to look glamorous, but I also didn’t wanted her to be completely picture-perfect. I draw her with a bigger nose than most of my female characters and as I was designing her Janet and Ari encouraged me to beef her body type up a bit because she’s like a stunt woman and she’s muscle for the mob. I wanted her to look believable as an action hero as well as be able to put on an evening gown and glam up. Is that unusual to see strongwomen in that era? Janet: Well if you look the noir movies there’s a lot of tough broads in those movies. You’ve got Ida Lupino and Virgina Mayo who was always planning James Cagney’s girlfriend. They look like they could take you. They’re pretty tough… and well-developed as characters too. Janet: I’m going to have to curate my own film series or something. Do you have quite the film collection, Janet? Janet: Yeah, you could say that. I guess I do have a lot of VHS. My taste runs toward eclectic stuff so sorry about that. If there’s anything you want, I’ll see if I can get you a copy. And how much did your reference from these films for the comic? Megan: For me, it always starts with the characters, so a lot of it started with fashion and hairstyles. Janet sent awesome reference all the time of locations and moods. I would look up camera angles of still shots that maybe I wouldn’t necessarily think of, things like dutch angles, extreme low shots, extreme high shots, high drama stuff to cue off of in terms of how to frame a certain scene. 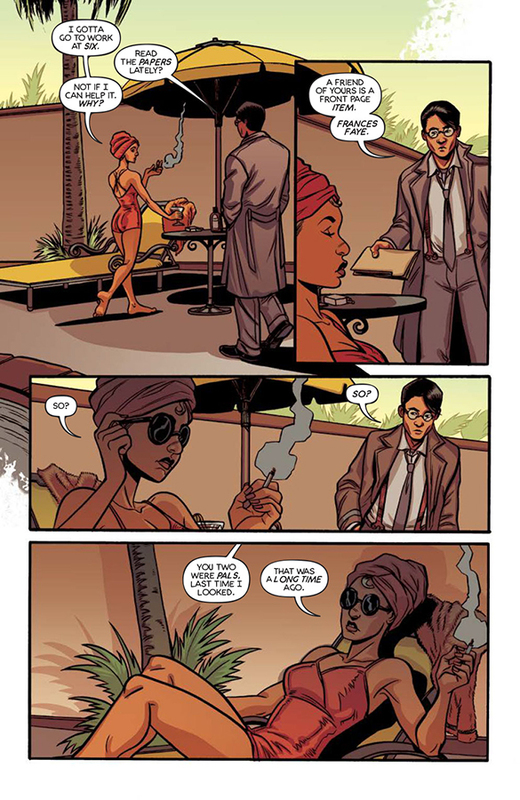 Nick: When I started on Powers, Brian (Michael Bendis) and Mike (Avon Oeming) were like, “Here’s where we come from as far as film goes,” and so The T-men became my bible for noir. One of the things I was really excited for with Angel City was taking that idea and those shots and applying it differently. But I’m still pulling from the same old gangster movies. Janet: Yes, I have a very cynical worldview, I guess. The theme of this story is that things are not what they seem. You have these politicians and studio heads who are all doing this stuff in the background that result in the death of this girl. And Dolores is going after them for justice for her friend, but it uncovers so much more. It’s like pulling back up a rock and seeing all this gross stuff going on underneath. That’s really the theme the story. Nick: You’ve said before in a couple of other interviews that she’s going after justice for her friend, but when I was reading it, I thought that was the thing that got her in the door but really, the follow through is that she’s just venting out frustration on all of these people. Janet: Well, she definitely has a big chip on her shoulder. She thinks with her fists. She just starts beating on stuff and being like “Oh, wow. That was probably not a good idea.” So yeah, in many ways she like a noir hero. Nick: I guess you could say she’s less of an “angel” than you might think. Guys… anyone? She starts off as a pretty tough character. I’m thinking back to that scene when Joe tells her about Frances’s death and she basically shows no reaction at all. Janet: I know, I read it again myself when I saw the whole thing together and i was like, “That’s really cold.” So yeah, she starts out in a way where she can’t even afford to feel this. She’s got some very bad coping mechanisms, let’s put it that way. Nick: Part the idea for using the heat for the colors came from that scene because I wanted that contrast. She’s like so deadpan and doesn’t care while Joe is approaching her with such desperation being all like, “You should really care about this. This is a problem.” So I wanted the colors to contrast her being so cold, like there was this quiet rage. Megan: That flashback scene from the first issue is where I draw the colder side for Dolores. Just seeing all these things that she and Frances went through together to try and break into Hollywood. And Frances is always hopeful and Dolores doesn’t care. She thinks these things are so stupid and they’re not going to help. She loses that optimism that she had when she first got to L.A. Frances would be the eternal optimist and Dolores would just be like “Screw this!” So it’s sort of her default reaction even when she finds out her friend is dead. Janet: I wanted to start her in this place where the reader would be like, “How do you get like that? !” And then the flashbacks show how you get like this. She just got harder and harder and harder as this stuff happened to her. And then that’s what she has to come back from for the story to start, for her to find out what happened to her friend. You can follow Janet Harvey on Twitter here, Megan Levens here, and Nick Filardi here.